Roofs may be constructed from different materials, including metal, wood, clay, shingle and concrete tiles. Whatever your roof type is, the formation of algae, moss and fungus on your roof is unavoidable. Since moss and algae need water to multiply, places with more rainfall and humidity have higher infestation of these unwanted roof guests. Large trees that produce shade on the roof could advance the growth of moss and algae since water and dew on the covered areas tend to evaporate slower because of their lesser exposure to sunlight. Different solutions are available for the homeowner affected by these unsightly growths on their roofs. One effective method of preventing moss and algae from growing on the roof is through the installation of a zinc or copper strip just under the ridge of the roof. 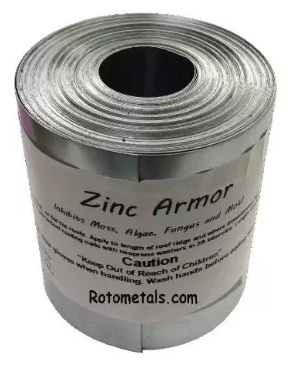 One such roofing repair product preferred by buyers is the Roto Metals Zinc Armor zinc roll. It is available in a three-inch wide roll that is 50 feet long. Its manufacturer claims that it prevents the formation of moss, algae, fungus, lichen and mildew on the roof by inhibiting their growth. The product is said to be effective for up to 20 years. It can be used on practically any type of roof, which include wood, concrete, metal, asphalt shingles and tiles. It can also be used on other areas of the roof where the growth of moss and algae can occur. Ideal for both professional and do-it-yourself roofer because it is easy to install. Just put the Zinc Armor along the entire length of the roof ridge. It is safer compared to other products such as chemical moss control. Cost-effective as against repairing or replacing your roof. It lasts longer than traditional moss, fungus and algae killing methods. Environmentally-friendly and is not harmful to human, animals and plants. The product is easy to use. A two-person crew can do the job. Moss problem has not returned after using the product. Zinc Armor is better than other solutions because it is maintenance-free since you only have to install the zinc strip once, and it will do its work for years. Prevents moss from growing on new roof. Customers suggest carefully following the instructions, particularly nail intervals.